What can fashionable ideas, blind faith, or pure fantasy possibly have to do with the scientific quest to understand the universe? Surely, theoretical physicists are immune to mere trends, dogmatic beliefs, or flights of fancy? In fact, acclaimed physicist and bestselling author Roger Penrose argues that researchers working at the extreme frontiers of physics are just as susceptible to these forces as anyone else. In this provocative book, he argues that fashion, faith, and fantasy, while sometimes productive and even essential in physics, may be leading today's researchers astray in three of the field's most important areasÃ¢â¬"string theory, quantum mechanics, and cosmology. Arguing that string theory has veered away from physical reality by positing six extra hidden dimensions, Penrose cautions that the fashionable nature of a theory can cloud our judgment of its plausibility. In the case of quantum mechanics, its stunning success in explaining the atomic universe has led to an uncritical faith that it must also apply to reasonably massive objects, and Penrose responds by suggesting possible changes in quantum theory. Turning to cosmology, he argues that most of the current fantastical ideas about the origins of the universe cannot be true, but that an even wilder reality may lie behind them. 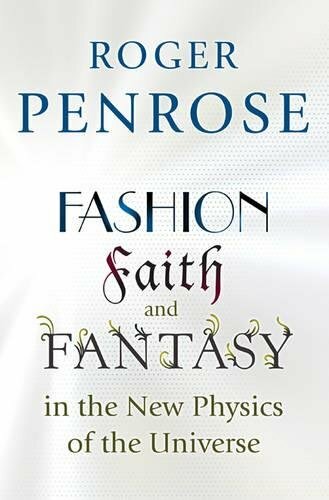 Finally, Penrose describes how fashion, faith, and fantasy have ironically also shaped his own work, from twistor theory, a possible alternative to string theory that is beginning to acquire a fashionable status, to "conformal cyclic cosmology," an idea so fantastic that it could be called "conformal crazy cosmology." The result is an important critique of some of the most significant developments in physics today from one of its most eminent figures. About: What can fashionable ideas, blind faith, or pure fantasy possibly have to do with the scientific quest to understand the universe?